Now Sony Xperia Z3 gets the unofficial AOSP 7.0 Nougat ROM. Here We will be sharing step by step guide to Download & Install Android 7.0 Nougat AOSP ROM On Xperia Z3. Follow the given steps to Update Sony Xperia Z3 to Android 7.0 Nougat Via AOSP Custom ROM. Xperia Z3 becomes the latest Xperia device to get the unofficial AOSP Nougat 7.0 ROM. Previously, Xperia Z1 has received the unofficial Nougat ROM. There are unofficial Nougat ROMs available for Some Xperia devices, Google Nexus 5, Nexus 4and Oneplus One. This is a great news for all Xperia Z3 users who want to experience the latest Android Nougat 7.0 on their devices. Follow the given steps carefully to Download & Install Android 7.0 Nougat AOSP ROM On Xperia Z3. Special thanks to XDA developer aclegg2011 for releasing the initial build of Android 7.0 AOSP ROM for Sony Xperia Z3. This method only works on Sony Xperia Z3 with TWRP installed on it. 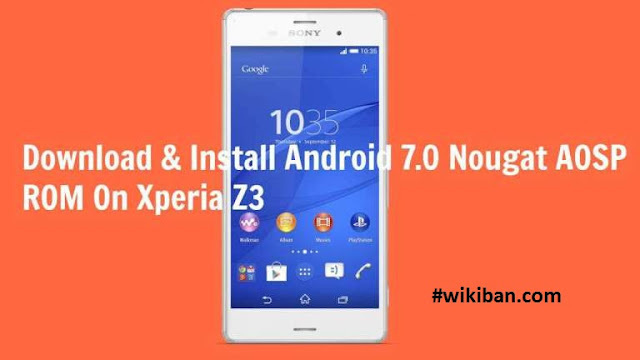 So make sure that your Xperia Z3 has TWRP then follow the given guide to Download & Install Android 7.0 Nougat AOSP ROM On Xperia Z3. This will Update Sony Xperia Z3 to Android 7.0 Nougat. www.wikiban.com will not be held responsible for any kind of damage occurred to your device while following this tutorial. Do it at your own risk. Now from TWRP Recovery take a proper Nandroid backup so that you can restore anytime you need. Your Xperia Z3 should be updated to Android 7.0 Nougat.